Finding unique clothes and accessories that no one else is wearing or has even seen in-stores can be slightly challenging. This is why you should shop at Joules with our VoucherCodes.ca Exclusive for free international shipping from this UK-based company. Though the prices are displayed in euros, the exchange rate to Canadian dollars isn’t as big as one might think! 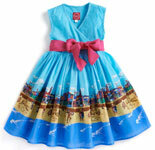 Any little girl would look absolutely darling in the Pier dress. Perhaps it might even be perfect for a day spent at the amusement park since it features merry go-rounds and ferris wheels! Made of 100% cotton and priced at about $50, it’s also available in a pink or beach print. With millions of different designs available online for the newly released iPhone 5, a truly unique one can be hard to come by. The creme floral case is certain to garner quite a couple of compliments with its flowery design. Even better is that it will save your phone from unwanted scratches in style! For about $33, it’s also available for the iPhone 4. We’d love to hear from you! Let us know if the comments below which Joules products have caught your eye.